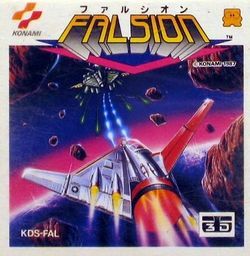 Falsion is a behind-the-cockpit Shooter game developed and published by Konami in 1987. It holds the rare distinction of being developed for not one, but two of the Nintendo Famicom's peripheral systems, the Famicom Disk System, and the Famicom 3-D imaging system. The 3-D imaging system used an LCD display to shutter the left and right eye, allowing the user to "see" a 3-D image by alternating which eye the screen was drawn for every frame. It was originally designed to work with Highway Star and was considerably unpopular. Falsion does not present any breakthroughs in the shooter genre, and the game play is rather unimaginative and repetitive. However, it does manage to make fantastic use of the 3-D imaging system, and is considered by those who have had the chance to play many of the system's games to be among the best. Falsion pits the player as the pilot of a ship while the camera remains fixed some distance behind the ship. Enemies appear off in the distance and rocket toward to player, or appear from behind and shrink as they get farther away. The player must survive through six stages, each of which presents a dramatically different scene for the battle to occur. : Use the direction pad to guide the ship in any of eight directions throughout the screen. You can move along the four cardinal directions, as well as any of the diagonals, to the edges of the screen. : Press the A button to launch a heat seeking missile if you have any ammo currently stocked. : Press the B button to fire your main weapons. Up to four bullets may be fired on to the screen at one time. : Press the Start button to begin a new game, or to pause the action mid-game. : Press the Select button to toggle the 3-D effect on and off in the middle of game play. 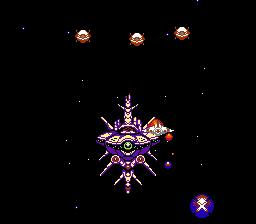 Throughout the game, you view the Falsion from behind the ship. Your mission is to successfully pilot it through six stage, dodging and destroying fleets of enemies that come at you wave after wave, until you ultimately reach the mother ship found at the end of each stage. You begin the game with three lives, and earn one extra life every time your score reaches another 100,000 points. Your ship is destroyed by colliding with any enemy craft or bullet. You can fire an unlimited amount of bullets from your main weapon, with a limitation of up to four bullets on the screen at any one time. You can also fire heat seeking missiles provided you have collected a red power up, and have missile ammunition remaining. 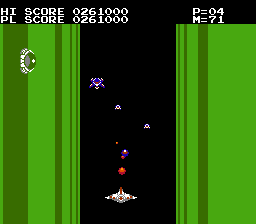 Throughout the game, a pair of orbs with the letter P on them will appear and rotate around the center of the screen. You can collect them simply by colliding with them. They will rotate for a short while, then zoom ahead into the distance, before snapping back behind you. When they fly back to the camera, this is your last chance to collect them. When collected, the blue power up orb will increase the movement speed of your ship (not the flight speed ahead, but the speed at which you can adjust your position on the screen.) Every red power up orb that you collect will increase your missile count by five, up to a maximum of 99. If you are destroyed and lose a life, your ship will return at the default speed and you will lose all of your stored missiles. Never stop moving. If an enemy is capable of firing, it will fire bullets at your present location. Enemy bullets travel rather fast, and it won't take long for them to hit you. As long as you are moving around and don't return to your original position, you can safely avoid all enemy bullets. Some enemies fly straight towards you, but they can be avoided in the same manner. Don't occupy the center. While no spot on the screen is entirely safe from attack, the center of the screen is particularly dangerous. Since your view of the screen is skewed down an angle at every location except the center, you will be unable to see if an enemy is firing at you from the center since your ship will block your view. If you must utilize the center of the screen, do so briefly before any enemy has a chance to fire at you, and move away quickly before someone does. Boss: The weak point of the first boss craft is also the source of its offensive power. The orb at the top of the center of the ship continuously fires bullets at you. You must hit this orb with your guns or missiles to destroy the craft. Because it fires bullets non-stop, you must also make sure that you move non-stop or one of the bullets is sure to home in on you. The craft moves about in a weird way, so if you attempt to follow it around the screen, you will give yourself enough motion to dodge the bullets that stream from the ship. Pelt the orb as quickly as possible or launch a few missiles to take it down. The second stage sees you flying over a lush forest at dawn. Two waves of enemies appear from above, and then two waves appear from below, with power ups appearing during that second wave. The next squads of enemies fly in sine waves over the canopy. They will fire at you, and it's easy to miss that fact if you are in front of them, so move out of the way. More enemies will appear from behind, launch forward, shoot at you, and return. If you destroy them before they get far enough out, they won't have time to fire. After another pair of power ups, a new enemy will zoom forward, and then split into three units at the last moment. After the next two power ups, hoppers will appear, jumping up from below the canopy to fire at you before landing back down. Shoot them at the height of their jump. Like last stage, a single enemy will appear in the center and split in two before circling around. Unlike last time, they will also fly further into the depth of the screen. Use missiles to take them out quickly. After they are destroyed, the sky will lighten up. Fast moving squadrons will appear from the sides before two more power ups appear. Then a new enemy will arrive. A circular craft will fly at a high altitude, getting closer to you, but stopping twice to bombard the space below them with a laser. The first laser can't harm you since it's out in the distance, but the second laser most certainly will hurt you, so avoid it. These ships are invulnerable to missiles, and though they can be shot, they take a lot of hits, so they are best ignored. You will be presented with a mix of familiar enemies for a while until a new enemy arrives. These new enemies have heat seeking missile of their own. Their missiles will chase you down unless you outmaneuver them, or shoot them down with guns or your own missiles. For the rest of the stage, you will encounter a mix of enemies, including the hoppers, the craft that fire lasers, and the heat seeking missile launchers. 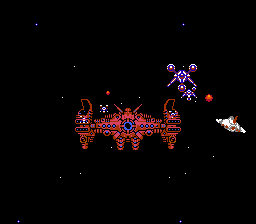 Boss: The boss ship at the end of this stage has a companion guardian that resembles a snake. This snake is invulnerable to attack, and can destroy your ship if you occupy the same space when it gets closest to you. Your bullets will bounce off of it. Meanwhile, the ship itself will fire a few bullets at you, so you can't necessarily hold still either. The ship itself doesn't necessarily move around as much as the previous boss, but rather wobbles a short distance to the left and right. Focus your attack on the orb at the center of the ship, and stick with it, diverting your attack only to get out of the way of the large snake. Beware that when you destroy it, the snake can still destroy your ship until it fully explodes. The third stage seems to take place inside of an endless trench. Cannons dot the left and right walls, but they won't always fire at you. Two waves of enemies bounce off the walls, first the right, then the left. Then two sets of three enemies approach, bouncing off of both walls. Two power ups will appear, followed by a wave of enemies that will shoot at you from a distance, before a series of green globes appear. These globes take many shots to destroy, but some of them contain red power ups, which will fly toward your ship when they are released. Enemies will fly around from the side, then two more power ups will appear. At this time, the cannons on the wall will begin shooting at you. After a set of enemies bounce off the walls, a new enemy will fly along side each of the walls, and attack horizontally when they reach your ship. A pair of enemies will rotate in the distance while missiles will launch from the right wall to the left. More squads of enemies will attack until a stream of enemies appear and bounce off the left wall. From there, you will fly through a long stretch of green globes. The wall cannons will fire at you. Shoot a missile off every now and then, and they will eventually lock onto a globe, destroy it, and release a red power up for more missiles. After that stretch, another pair of power ups appear. 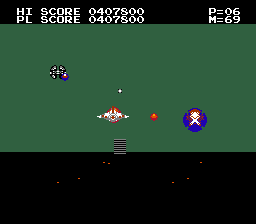 A set of missiles appear on the left wall, then the right wall, and then on both sides. Use missiles when they appear on both sides to create a safe-haven for your ship. After a pair of rotating enemies, green globes will appear in vertical pairs from the right to the left, finished off with a set of four. After another squad of enemies pass in front of you, waves of enemies will approach from the back while missiles fire off from the either wall. Finally a set of enemies will bounce off the walls and remain in your field of motion until destroyed. Use missiles to get rid of them if they are too close. Boss: The weak point of the third boss is the very easy to identify core in the center of the ship. However, the ship also has two hatches on either side. From those hatches fly out an infinite number of invincible craft. They will block your bullets, and absorb your missiles as they fly straight towards you. Do not fire your missiles when the craft are on the screen, as they will just go to waste. Occasionally, the hatches shut giving you a breather and a chance to fire straight on the core. Only during these times should you fire missiles in order to speed up the destruction of the boss. 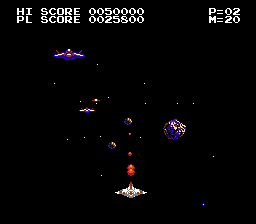 While the craft are flying towards you, you may wish to circle around the edge of the screen, although it is more efficient to make a figure eight, and shoot at the core when you cross through the center of the screen. 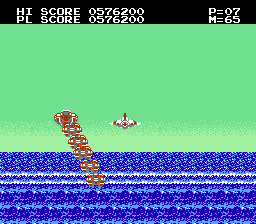 The fourth stage may be the most difficult, not because of the difficulty of the enemies, but because of the existence of the towering skyscrapers that you must avoid and fly around when they appear in the distance. Two waves of enemies, a pair of blue power ups, and a third wave appears before the first two buildings arrive, one on the left, then one on the right. 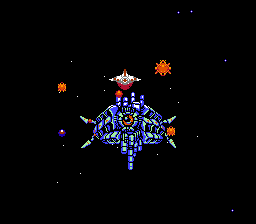 Another set of enemies appear high in the sky before two red power ups arrive. After the next wave, a single craft will appear, and split into two. They will circle around in the sky. Shoot one and use a missile on the other. A new enemy will appear. They blink on the screen to indicate their approach from behind you, and then solidify when they arrive as they fly into the distance. They are difficult to hit unless you use missiles, so you should just focus on avoiding them. After another set of enemies, you will enter into a stretch full of buildings, and an enemy that flies at you in the sky. This enemy will shoot at you, but if you hit it, it will break into two pieces, flying in opposite directions. You can then shoot the pieces for more points, but focus on avoiding the shots that they fire at you and the approaching buildings. 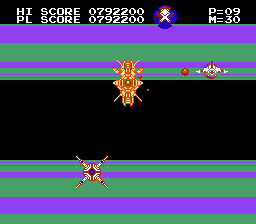 The very last enemy which appears in this stretch hovers at the top of the screen and fires down upon you if you pass beneath it. Take out the next squadron while avoiding the building that appear from right to left. A new enemy will appear which floats along the floor and lifts off at the last minute. You can take them out before the rise if you shoot at them low to the ground. Another craft will appear and hover along the ceiling, firing down at you, while a partner will also appear along the bottom to fire up. If you don't take them out on their approach, use missiles to get rid of them. More ships will arrive from behind, but only along the top while you pass more buildings. Then a pair of ships will approach and split up, making four rotating enemies. Use a combination of guns and missiles. As you continue to pass buildings, ground enemies will be followed by air enemies, and then ships that appear from behind and pass you. The last set of enemies will appear in the sky before the boss arrives. Boss: Once again, this boss uses a type of craft to both attack you and lure away your missiles from striking the core. Unlike the last boss, this one also fires bullets at you, and the enemy craft never stop appearing. However, also unlike the last boss, the craft that this one releases are vulnerable to your guns. Since the craft never lets up, you will have no good opportunity to use your missiles. You will have to rely on your ability to keep moving while at times focusing some of your shots on the core at the center of the ship. Once again, a figure eight is the most efficient way to accomplish this. If you happen to have a lot of missiles (more than 30), you can attempt to spam them while firing your guns. If you're lucky, your guns will take out the enemy craft before the missiles do, and the missiles will continue on to the boss. 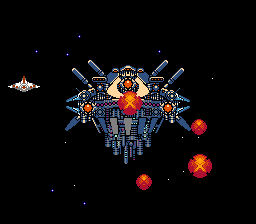 Boss: The boss of this stage employs a similar strategy of utilizing craft to lure your missile away from the core of the ship. The craft that this ship sends out are three small ships who fly out to the distance of your ship, hesitate for a brief moment, and then self destruct sending out a small radius of lightning. These craft can be destroyed before they arrive. When all three disappear from the screen, the ship sends out three more to attack, all while firing bullets at you. If you intend to use missiles, you should wait until just before the craft finish exploding. In the short duration between when the old craft are cleared away and new craft are sent out, the missiles will seek out the core of the boss ship. Between missiles and gun shots, you should be able to remove the boss fairly swiftly. Stage 6 is the opposite scrolling effect of stage 3; rather than passing left and right walls, you fly between a never ending expanse of floor and ceiling. This stage contains a lot of variety, but not as much challenge as the previous stages. Enemy waves are fairly standard until you encounter a set of jumping machines that fire at you as they jump along the surface. They are followed by a set of rotating tiles. These tiles are indestructible, and bullets will ricochet off of them. Dodge them all, and the next set of enemy appear among electric prod that jut out from the ceiling and floor to make a lightning rod. You can destroy one prod, but it won't stop the electricity from appearing from the other. The next enemy to appear are circles with four spikes along diagonals. The rush to the distance of your ship, and then attack laterally and can be very difficult to predict and avoid. Use missiles (of which you get very little in this stage) liberally against them in order to survive. After another squad of air enemies, some ground enemies appear, followed by more rotating tiles. The electric prods return, accompanied by a green enemy which suddenly appears in front of you, fires at you, and rushes toward you. More air enemies, mixed with jumpers appear, followed by electric prods and more tiles. 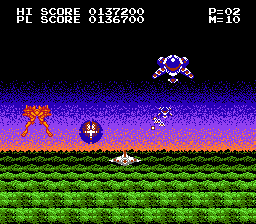 Many mixes of enemies will begin to appear at a rapid rate, including the four-spike enemies, electric prods, jumpers, and the green enemies which teleport into view. Eventually a vision of two slender crafts will merge into one while four-spikes appear all around you and chase you. You must keep moving around because of the four-spikes while you attempt to hit this very narrow target. Missiles are very effective, but you must ensure that they will hit the craft and not the four-spikes appearing around it. 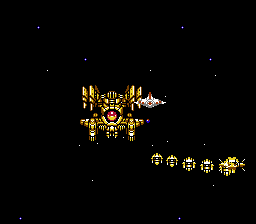 Then the mixture of enemies will begin again and continue for a brief moment before the boss appears. Boss: As you can see, the sixth and final boss has three weak points, one high in the center, and one on either side. The central weak point will remain invulnerable until the two side cores are destroyed first. When the ship first appears, it fires a barrage of cannons at you which ricochet off the sides of the screen, and in and out of the depth. They can only hurt you when they occupy your plane of distance, and they can be shot down with guns, although they will be replaced very quickly. They make using missiles against the ship impossible, so don't try. The ship will not move, but after a period of time, it will blink out of sight and appear in a new location on the screen. When one side core is destroyed, it will fire one slow cannon straight out rather than replacing the barrage of cannons. When you destroy both sides, the cannon barrage will stop, and the remaining core will shoot a continuous stream of regular bullets at you. Once again, you must continue to move in order to stay alive. The ship will continue its pattern of waiting, blinking out, and reappearing somewhere else. The bullets will continue to fire even when the ship is blinking. You must move in a pattern that allows you to shoot at the center core. From a good position, you may wish to move to the left, up, right, and back down to shoot at the core, and then move right, up, left, and back down to shoot at it again. Repeat this pattern, stopping just long enough to get several shots in on the core before you have to move again to get out of the way of the oncoming bullets. 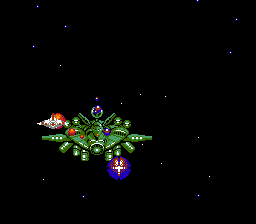 Once you take out the last core, the ship will explode, and you will be treated to the ending and credits, before the game starts back over from the first stage at a higher level of difficulty. This page was last edited on 13 March 2012, at 23:09.